Transforming what was once a formidable, densely packed head of cabbage into mere shreds with your hands is an act of empowerment. You too can own this sense of triumph—and when the resulting salad comes out tasting great, it’s doubly satisfying. I was surprised by how many compliments I received on it; I had been afraid that people would find raw cabbage in pieces bigger than a sliver (i.e. coleslaw) to be too strange, too hard or crunchy. But instead, they were delighted by the brittle, succulent leaves, slicked with a tangy honey-mustard vinaigrette. This time of year is especially good for enjoying raw cabbage, since you can find crisp, fresh heads harvested not long ago. It’s nothing special and certainly not luxurious. 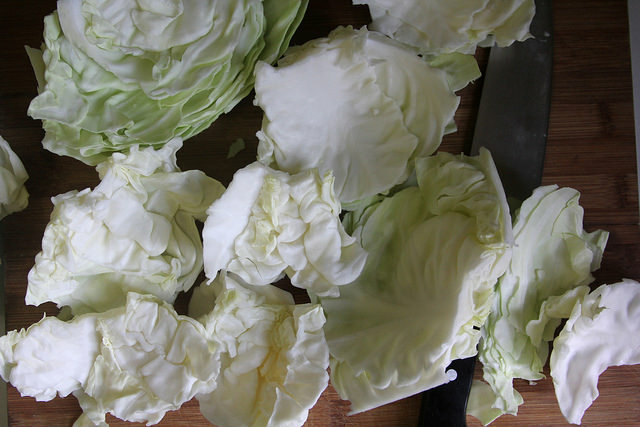 But sometimes the most humble of vegetables—like the cabbage—presented in a new way can be a real thrill. Sick of raw kale in a salad? That novelty may have worn off by now for many. 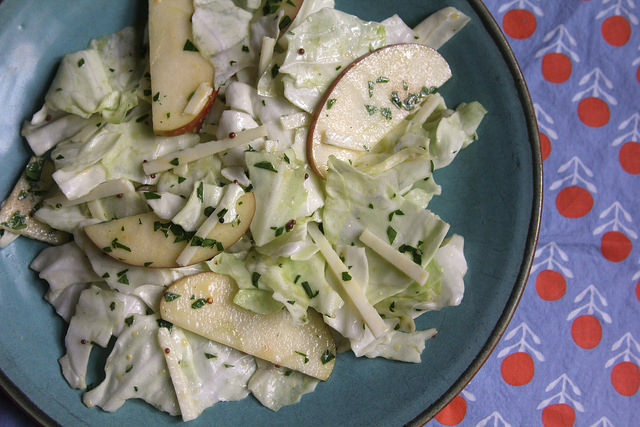 Try giving raw cabbage a turn at your Thanksgiving table, or holiday potluck. I’ve been tearing up green cabbage like this for a while, so I’ll share the method, if you can call it that (or is madness a better term?). It starts with the freshest head of cabbage you can find. How to tell if your cabbage is fresh? Just turn it upside-down and check out the cut stem. If it’s white, it’s very fresh; the more brownish and bruised it looks, the longer ago it was harvested. I like to carefully cut around the core, or stem of the cabbage from the bottom, angling inward with a knife so that you remove a dome-shaped hunk of white. Then, trim off some of the really thick ribs from the outer sides of the cabbage. Now, the knife can be put away. It’s all you from here on—go ahead and pull apart the head and rip through its leaves, bits of cabbage sometimes flying up in the air. Then tear it some more. And more, until you have somewhat uniform, bite-size pieces. You do not have to be a particularly angry or stressed-out person to enjoy this task. At the very least, it’s a very good way to exercise your hands and wrists, like clenching those balls of sand. Yes, you can discard (or save for stock) the really super-thick, fibrous pieces. Just go through them until you have small enough pieces to ensure that no one needs to use a fork and knife. And separate the leaves that want to stick to their outer-leaf buddies. I find that mustard, honey, apple cider vinegar and olive oil is a pretty good formula for a salad dressing. You can adjust the levels of any of the components to your liking, and be sure to add salt and pepper to taste. I recently made a version of this salad with the same dressing and strips of mortadella and raw onions (it was for a murder mystery dinner party, and “mort” means death!). But keeping it all vegetarian this time, some crisp apple slices were tossed in along with big slivers of Pecorino Romano, an aged sheep’s cheese. Now, enjoying a raw cabbage salad requires a certain toughness from the eater as well as the cook. Someone who doesn’t mind roughage in their diet doesn’t need tender baby greens in their salad all the time. If you feel up to the task, then dig into it this winter. There will be plenty of cabbages all year long in the Northeast—the delicate spring leafy greens have a long while to resurface from local soil. Peel off the first one or two layers of the cabbage until it looks unblemished. Carefully cut out the core from the bottom of the head of cabbage. Cut off the really thick ribs on the outsides, towards the bottom of the head. Now rip apart the head, and tear through the leaves, ripping and separating, until all the pieces are no bigger than 3″ long and none should require a knife to eat. Set aside. 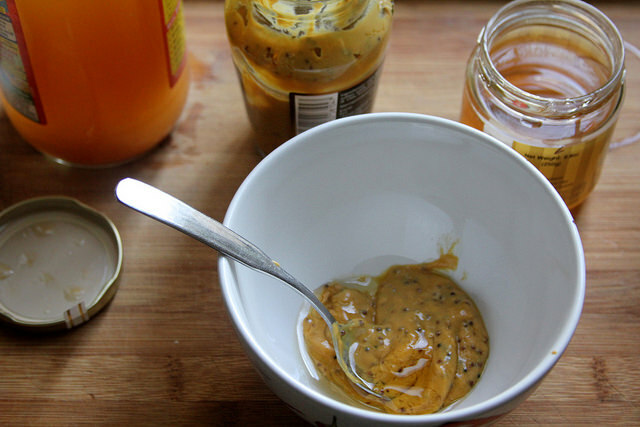 Mix the mustard, honey and vinegar in a small bowl and add a pinch of salt and pepper. Whisk in the olive oil while slowly drizzling it in. Taste, and add a bit more of any ingredient if you like to your own taste. Cut the apple flesh away from the cores. 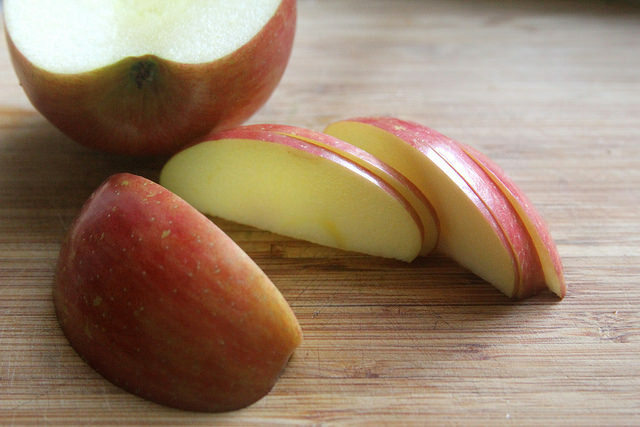 Finely slice the apple into slivers. 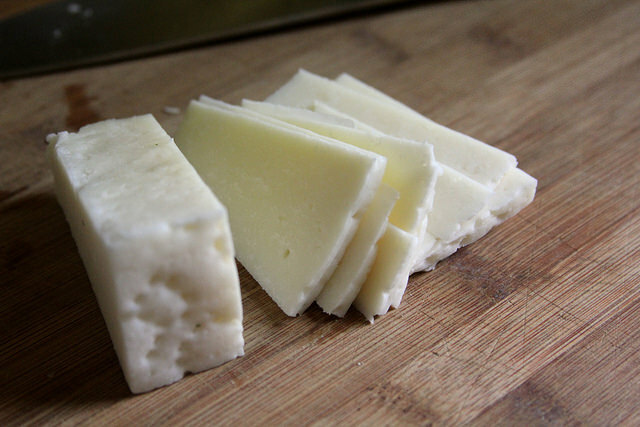 Finely cut the pecorino, and then cut into matchsticks (or keep as bigger slices if you like). 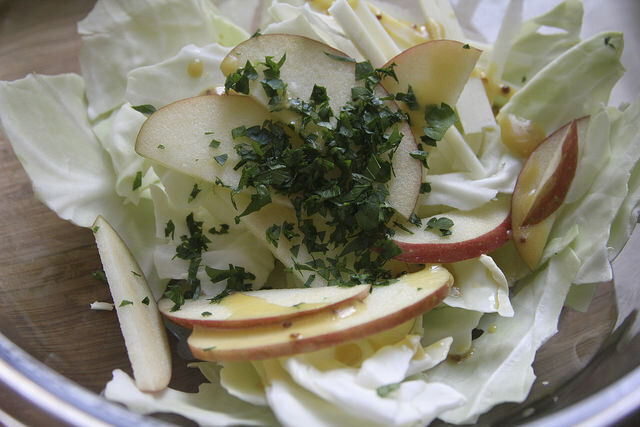 Combine the apples, pecorino, cabbage and parsley in a large bowl and toss together with the dressing just before serving. Serve immediately. Three brownie points: This is a wonderfully nutritious side dish, because it’s mostly just cabbage. And green cabbage is chock full of antioxidants, phytonutrients, along with calcium, fiber and potassium. If you’ve never tasted it raw (or if you have but hate coleslaw) then you might be surprised at how sweet the fresh, raw leaves can be. And by not cooking or preserving cabbage, you won’t unlock their sulfuric side, which can be challenging for some. However, eating raw vegetables, cabbage included, has its downsides, as it’s harder to digest. But unlike most leafy greens, you won’t have to worry much about pesticide residue on each and every leaf. 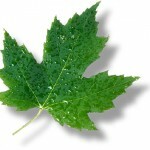 Seven maple leaves: A great winter dish, since both apples and cabbage can be kept in cold storage all year round. We mentioned how cabbage is bound to have less pesticide residue, so it’s not one of those veggies that you really ought to opt for organic with. But it’s also a hardy crop that’s easy to grow in all kinds of conditions, requiring relatively little water to survive and withstanding frosts, so not a surprise people have been eating them in cold climates for so long. Embrace it this winter all whichways! It sounds great. Thank you for sharing the recipe! 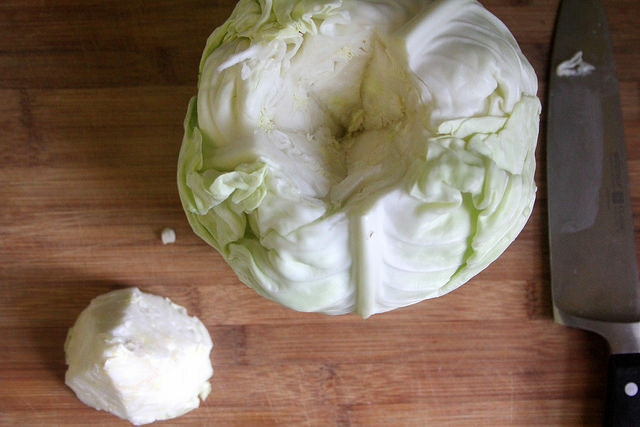 Winter is great time for every dish with cabbage. This is true that torn cabbage is makes you healthy.